Raising the bar with a new pub group brand that puts people first. Ultimate were tasked with devising a name and brand for a new pub group, where people are the key to the business’ success. Colleagues and customers are all part of one big family. This brand would become the overarching brand of all current and future establishments, enabling them to continue to grow their business in a sustainable and responsible way, whilst maintaining the same strong ethos for customer experience. The Barnes family partnered with Robinsons brewery in 2010 and became the new landlords of the George & Dragon in Holmes Chapel. After running the George & Dragon for eight years, Martin, Steve and Christine felt ready to move on to the next challenge by acquiring a second pub, the Antrobus Arms in Northwich. However, they needed a strong brand that would become the mothership of their current and future establishments and that would go onto attract the best talent, suppliers and investors. This would be their corporate brand, but also the device to connect people to their business. The George & Dragon’s success as a pub is built on the people, whether it be the front of house, kitchen colleagues or their customers. The Barnes family pride themselves on the close relationships they have built with both their colleagues and their customers and this is shown in the way they always go the extra mile in everything they do. For Martin, Steve and Christine going out with family and friends isn’t just about eating great food and drinking great wine, it’s about finding somewhere that’s a home from home, a place that cares. Putting Family at the Forefront. For the Barnes family and their colleagues , people are the backbone of their business. The new brand needed to reflect their core values; their door is always open, they genuinely care for people and that their pubs provide a safe, secure and familiar environment for all. 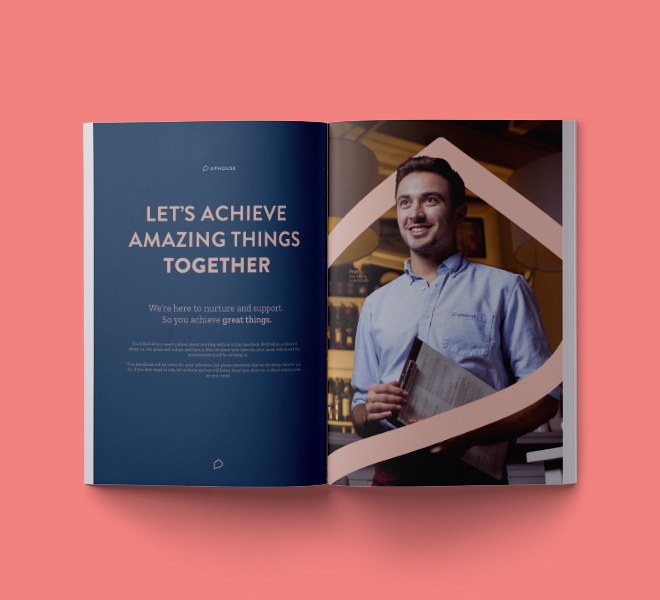 At its core, the brand needed to be genuine, trustworthy and inspiring, showcasing the portfolio of establishments and differentiating them from competitors. The brand also needed to position the business as an authority within the industry, a place of experience and expertise. It was essential that the new brand was seen as an appealing and supportive place to work, attracting the best employees to the business and particularly, those that would fit best with their culture and live and breathe their values. Despite the new brand’s different target audiences, which would include: talent and recruitment, suppliers, investors and the rest of the industry, their messaging needed to be the same. This messaging and the tone of voice needed to be consistently empathetic, family orientated and empowering. The brand would feed into a wide range of marketing collateral ranging from colleagues uniforms, business cards, letterheads, magazine ads to the actual food menu. The challenges that Ultimate faced when creating this brand were partly due to the extent of the competition in the pub industry, it was critical that the new brand stood up against existing strong heritage brands. Martin, Steve and Christine were also adamant that the brand could not feel cheap, but not expensive either as this would alienate people from the brand, therefore Ultimate had to take careful consideration of these wishes when creating the look and feel. Finally, this new brand had to be future-proof, remaining constant as the business grows and acquires more establishments in the future. Ultimate created an uplifting and family-orientated brand for colleagues and customers. After lots of thought, the Ultimate Design team conceived the name Uphouse, by playing with the term Public house. 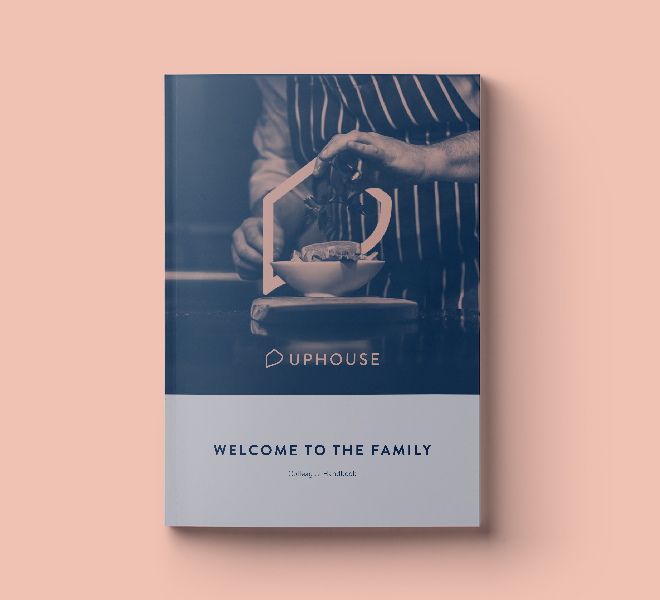 The team decided that Uphouse perfectly reflected their business values: progress, support and most importantly that their establishments are a home. Employees aren’t just working for a pub, but are part of something bigger and will be supported and pushed towards achieving their career goals and aspirations, whilst being respected and trusted to serve customers the way they know best. Following on, the name Uphouse directly inspired the brand mark, which consists of three determined elements: an upwards arrow to mark the brand’s focus on empowering its people, the house to represent how their establishments are a home from home for both colleagues and customers, finished off with a curved line indicating an arm of support. The creative then adopted the brand mark as a device to connect people to the brand, as it visibly interacts with elements within compositions to envelope and wrap around people, elevating and uplifting them. Within the photography, images of colleagues’ faces are framed with the Uphouse brand mark as they carry out their tasks, creating a sense of collectivism and purpose. The Uphouse business is also reflected in the copy, which includes inspiring statements such as ‘let’s achieve amazing things together’ or ‘House rules’ with lists the businesses core behaviours relating to the concept that Uphouse, as with every home is a place of security, support, encouragement and respect. Colleagues will be proud to be part of the Uphouse group, the Uphouse logo is a stamp of quality, a stamp that colleagues are proud to wear.